Dr. David Jernigan, Biologix Center: One of the most researched and versatile health devices you can buy! One of the most researched and versatile health devices you can buy! The skin is the largest organ of elimination of waste and toxins. A healthy person's skin eliminates 2.5 pounds of waste acids and toxins per day! While studying Biological Medicine, I was impressed to find that some of the world’s most successful Biological Medicine Hospitals and Clinics in Germany, Switzerland, and the U.S. use the infrared saunas for almost all of their patients. In our highly toxic world, there is almost no person who would not benefit tremendously from the health promoting effects of this therapy. Infrared saunas work by emitting far infrared energy, which penetrates the body just over four and a half inches! The deep penetration of heat is much cooler, making it more comfortable to sit in, and they are more efficient than traditional steam saunas. Infrared is a fascinating technology. Just like visible light is a spectrum of frequencies that we experience as various colors, infrared saunas emit can be tuned to emit a specific frequency. Scientific research has now resulted in saunas that emit a finely tuned infrared energy output that closely matches the body’s own radiant energy. What this means is that almost 93% of the infrared waves are absorbed into the body. With this much absorption of the infrared waves, the body heats up, but the air in the sauna remains cooler. The cooler environment of the sauna is much more pleasant to sit in, and the air is not so hot to breathe. So many of the chronically ill patients I see know that they should work out and do aerobic exercise as part of living a balanced life; however, the illness they suffer usually prevents them from performing truly meaningful workouts. Many are too sick, too tired, too depressed, too overweight, in too much pain to work out, or working out would cause them to feel even worse. If you are one of these people, I’ve got exciting news for you! In 30 minutes of sitting, infrared sauna therapy has been shown to burn up to 250% more calories than spending 30 intense minutes on the best aerobic exercises, rowing machines, and long-distance marathons. It not only burns more calories, but it has also been shown to have many of the same cardiovascular benefits as well! The best broad-spectrum Infrared saunas are the Sunlighten Saunas, un-treated basswood sauna, and emits virtually no harmful EMF pollution. Other manufacturers use plastic, cedar, hemlock and other materials that in the heat of the sauna can continue to out-gas chemical smells that can cause endocrine system interference, and often emit harmful amounts of EMF pollution. If you have a sauna already and are feeling badly while or after you sit in it, you might just be suffering from the dislodging of toxins in your body, however it could be that you are reacting to the wood or plastic of the sauna, or the emitted EMF. 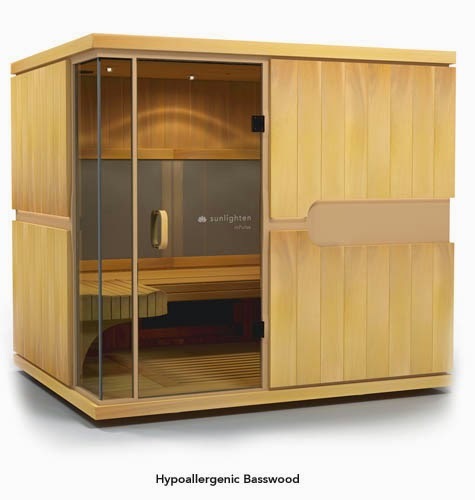 The specific sauna we use at the Hansa Center is the Sunlighten 6 person basswood broad-spectrum sauna, equipped with Chromotherapy, and Acoustic Resonance Therapy (ART) to achieve even deeper and more profound healing. The healing music played for the Acoustic Resonance therapy in the sauna is frequency-enhanced tones that have been shown to harmonically optimize the cellular and potentially genetic functioning. Often we use Michael Tyrrell's Wholetones CD and have seen a "quantum leap" in our results. Their are several good EMF detection devices on the internet. Dr. Klinghardt, M.D. has a great page that provides sources for these devices and other possible solutions: EMF Detection Devices These EMF detection devices are fascinating to use and to go around your house testing all the emissions from your computer, tv, and other electrical things like outlets that may be hindering your body's ability to heal. Not everything can be fixed with pills, IV's, and supplements. You can heal in a hospital or you can stay healthier and heal at home in your own broad-spectrum infrared sauna.